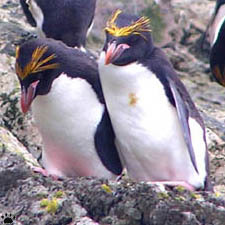 The Macaroni Penguin, Eudyptes chrysolophus, is a species of penguin found from the Subantarctic to the Antarctic Peninsula. stiffened and flattened into flippers for a marine lifestyle. at least 216 breeding colonies at 50 sites have been recorded. the Kerguelen Islands, the Heard and McDonald Islands. 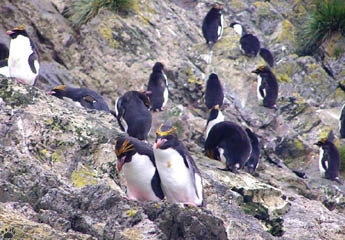 Macaroni penguin prefers steep rocky slopes. About half of the world's population breeds in Scotia Sea area, with 3 million pairs in sixty colonies at South Georgia, and smaller colonies on all other island groups. 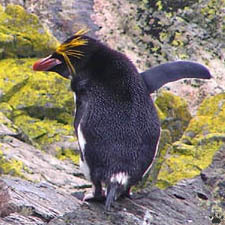 On the Falklands and Tierra del Fuego it is rare, but its close relative, small rockhopper penguin (E. chrysocome), is very common (2.5 million pairs on the Falklands, 175,000 on Tierra del Fuego). 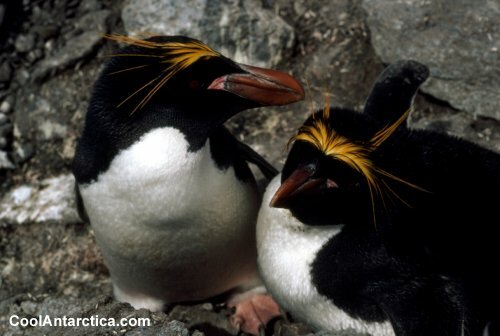 The latter is even better at rock climbing and porpoising..
David Attenborough looks at Macaroni penguins and there nesting habits. 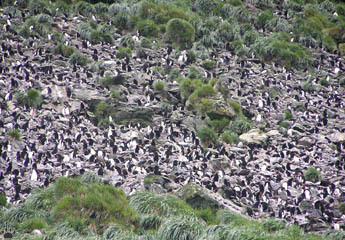 With such small oasis of land used and thousands of penguins per colony. 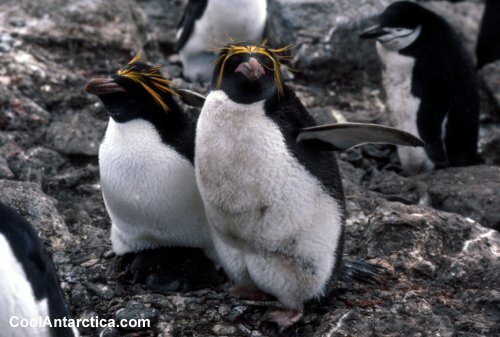 These cute little yellow plumed birds are reputed to be the angriest of all the penguins! 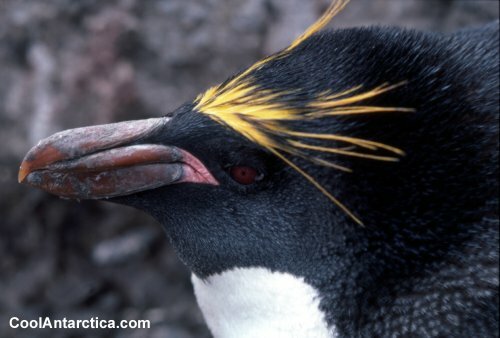 Both macaroni and rockhopper pingviner feed mostly on krill, but partially switch to fish and squid when they feed their chicks, or when krill populations crash. They usually dive to 10-80 m, and are are more migratory than king pingviner. Their breeding season is highly synchronized breeding season, with all eggs in a colony laid within 2-3 weeks. Birds start arriving to colonies in October, and leave in late February-March. Unlike king pingviner, they build nests of grass and pebbles and lay two eggs. The first egg is usually smaller and seldom hatches. The numbers of both species are apparently stable at the moment.